EVER SINCE THE iPad came out in 2010, it created an entirely new industry that hadn’t existed before. Fast forward to today and there are a number of competitors in the field offering their own take. 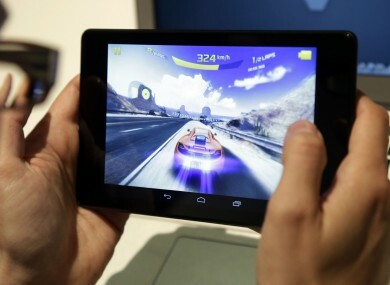 Much like the smartphone market, there are a number of decent tablets out there that would suit professionals, entertainment lovers and the casual user. Here are the best tablets on the market and the type of person they would be suited towards. Google has really pushed its Nexus range, which has improved over time, but it’s the Nexus 7 that is the jewel in its crown. The screen is the right size for holding, the display is sharp and suited for watching movies and videos, and the Android OS allows a great deal of flexibility with customisation. It’s perfect if you’re on the go, or just want something to pick up once you get home. It’s also cheaper than its closest counterpart, the iPad mini, so if you’re price conscious, it’s the one to side for. What’s to say about the iPad mini that hasn’t been said over the last twelve months? Its size means it’s easy to carry around, its format is perfect for reading and the retina display means everything is pin-sharp. It’s more expensive than other competing tablets like the Nexus 7, but access to the App Store, which has higher quality apps across the board, could edge it for people. Either way, you can’t go wrong. Amazon’s Kindle Fire HDX 7 builds upon the success of the original Kindle Fire and takes advantage of its vast multimedia collection. Boasting a high-res screen, this 8.9 inch tablet is one that’s designed for use at home with the company’s vast collection of books, movies and TV shows to choose from. While it has a great battery life, the tablet doesn’t have access to Google Play, which limits its use. If you’re more business orientated, then the Surface is worth taking a look at. Microsoft has given it a touchpad keyboard allowing users to treat it as both a work device and a multimedia device. Its hybrid nature of laptop and tablet can feel weird at times, but it combines both pretty well and while it won’t replace your laptop entirely, it will certainly be useful for smaller work tasks that pop up regularly. It is the most expensive tablet in this list, meaning that casual users might want to look elsewhere. If you’re the kind of person who loves connecting up your devices, then Sony’s Xperia Tablet Z is the one for you. As well as being waterproof (handy if you accidentally spill a drink on it), the tablet’s performance is solid, it’s light and compact and has an impressive screen. As it’s a Sony product, you can practically turn it into a entertainment hub, provided you own other Sony devices. The only problems are the Android skin it uses isn’t as good as what you would find on the Nexus 7 and the problem of bloatware rears its head again. Despite those problems, it’s a good tablet and it gives Sony a decent foundation to build upon. Saying that the iPad Air is the best iPad yet may come across as the kind of breathless hype that normally surrounds Apple products, but it’s true. Like the 5S, Apple has refined what was already great about the iPad and turned it into a must have. Email “Buyers' Guide: Which tablet should you get?”. Feedback on “Buyers' Guide: Which tablet should you get?”.